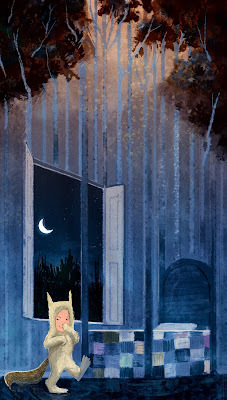 Erin McGuire does such beautiful and amazing work and her Terrible Yellow Eyes piece is no exception. This is one of my favorite moments from the book and I love how Erin interpreted it. Stop by Erin's site to see more. Terrible Yellow Eyes is a collection of works inspired by the beloved classic, Where the Wild Things Are by Maurice Sendak. The contributing artists share a love and admiration for Sendak's work and the pieces presented here were done as a tribute to his life and legacy. This project ran from May 1, 2009 - January 1, 2010.